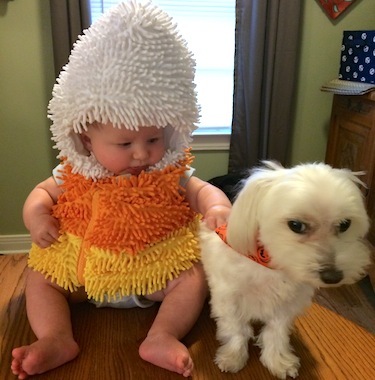 If you offer something besides candy, will the little ones think it’s a trick or treat? Halloween is swiftly approaching. I love the costumes and watching the kids. I don’t love all the candy. It’s predicted that 2.7 billion dollars will be spent on candy in the US this Halloween. That’s a lot of sugar that none of us really need. I not opposed to occasional candy or dessert and I don’t want to take the fun out of trick-or-treating, but this year I’m going to explore some edible candy alternatives rather than giving you lists of gluten-free candy or non-candy items. After all, getting something different to eat is fun too! 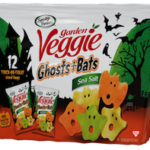 If you’re a fan of Sensible Portions® Garden Veggie Straws (which I like because they’re actually straws that you can blow air through), you’ll love Garden Veggie Ghosts and Bats! They’re crispy, salty snacks shaped like, you got it, ghosts and bats. Packaged in .05 oz bags for Halloween, these crisps have less fat than potato chips. Who doesn’t think Darth Vader is scary? Aged White Cheddar Popchips shaped like Star Wars ships and characters are now available in .8 ounce bags perfect for Halloween. These gluten-free chips have no cholesterol and no trans-fats. Seneca 100 calorie bags of Caramel Apple Chips are gluten-free, kosher and have 30% less fat than regular chips. I like the plain apple chips, but the caramel apple flavor is a great riff on retro Halloween treats. These look just like regular bags of microwave popcorn, but are only 1.6 ounces. Some years you can find orange and black packages especially for Halloween. Other years, it’s only the smaller size that differentiates these from regular microwave popcorn. Several brands are available online and from brick and mortar retailers. Snack sized bags of SkinnyPop Popcorn are GMO and preservative free. Flavors include Sea Salt & Pepper, White Cheddar, Jalapeño, and Dusted Dark Chocolate in addition to regular. If you prefer SMARTFOOD® Popcorn, the White Cheddar Cheese, Theater Butter, and SMARTFOOD Delight® Sea Salt and White Cheddar Cheese flavors are gluten-free. 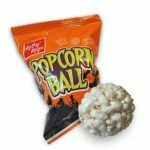 While we’re talking about popcorn, you may like Kathy Kaye Foods’ Halloween Popcorn Balls. This option contains sugar in a retro presentation. Remember when these were homemade? Each ball is 110 calories and 18 g of sugar. That’s the same amount of sugar as a Snickers® Miniature, but with 60 less calories and a lot more novelty. Individual yogurt servings in an easy to carry, easy to open, package. The packages have trivia, games, and jokes on them making them fun to unpack from your trick-or-treat bag. Although each flavor contains 8 grams of sugar, it also has probiotic cultures, calcium, Vitamin D, and protein. Wouldn’t it be great if they packaged these as monster poop for Halloween? The size is good. The raisins are sweet and healthy. The only thing lacking is themed packaging. Nonetheless, this is a good gluten-free option. Although I love them, I hesitate to recommend nut mixes for Halloween. Seeds are an alternative to nuts. FritoLay® offers a variety pack of Spitz® Seeds in various flavors. Salted Sunflower Seeds, Chili Lime Sunflower Seeds, Cracked Pepper Sunflower Seeds, Dill Pickle Pumpkin Seeds, Dill Pickle Sunflower Seeds, Salted Caramel Sunflower Seeds, Seasoned Pumpkin Seeds, Seasoned Sunflower Seeds, Smoky BBQ Sunflower Seeds, and Spicy Sweet Chili Sunflower Seeds are all made without gluten-containing ingredients. Please note that these flavors are not made in a dedicated facility or on dedicated gluten-free equipment. Use appropriate caution. Variety snack packs of mainstream chips are available everywhere. If you need to grab something at the last minute, this can be an easy option. Avoid Sun Chips and stick with the gluten-free flavors of Cheetos, Fritos, Doritos, and Lays Potato Chips. I realize that some of these options may be more expensive than what you’re used to buying. 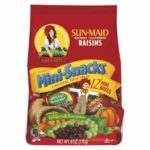 Keep in mind that most of them are bulkier than mini candy bars, so children are less likely to grab a handful meaning you won’t need to buy as much to begin with. If you live in a neighborhood like mine where many children are food insecure, you can also think of this as a way to reduce hunger in your community. Spend a little more and give fruit and vegetable pouches or individual cups of applesauce, mandarin oranges, peaches, or pineapple. 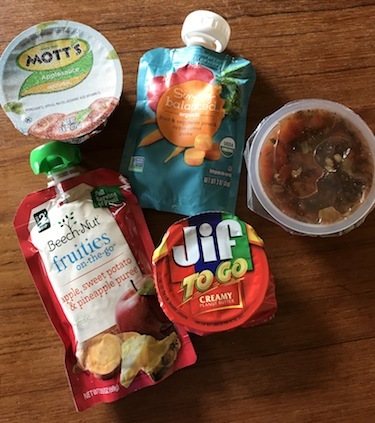 Put a box of raisins and an individual serving packet of peanut butter in a plastic bag (you may only want to give these to older children who can monitor their own allergies) for a do-it-yourself sandwich kit. Include individual cups of salsa along with corn chips. Give instant oatmeal cups, individual bowls of Cheerios, microwaveable brown rice, or pouches of tuna. If you decide to give substantial food items, but don’t want kids to feel awkward about taking them, get some Halloween treat bags (Oriental Trading has a good selection) or create your own Boo Bags using brown paper bags, bag up the food and hand out the bags instead of individual items. The surprise factor will entice. Hungry kids will be appreciative. Any child who is disappointed will get plenty of candy from other homes. Getting something different to eat is fun! Getting something gluten-free is special when you’re gluten intolerant. Getting something nutritious to eat is critical! I let this be my guide to trick or treat.